Miguel Cabrera started his 2014 season in style by signing a massive contract extension that will keep him in Detroit through the end at least one additional presidential administration and millions of Hot-N-Ready’s. He was coming off back to back M”V”P awards and four straight 6+ win seasons. He probably wasn’t the best player in the game, but he was very close. He was also recovering from offseason surgery to repair what ailed him down the stretch in 2013, so there were some questions about his overall performance. And we got some pretty weird answers through the year. While I don’t ever want to make too much of arbitrary end points or splits, I think carving his season into months is an easy way to demonstrate the year he had. Cabrera had two of his best offensive months as a big leaguer and a couple of his worst all in the same season. April and August were rough months for the slugger and May and September were among the very best. The June-July window was below average, but not to the degree that we would notice if not for the other extremes. You can take a look at his ten full seasons prior to 2014 and his monthly highs and lows in this chart to see exactly how he stacked up. For such a consistent offensive performer, Cabrera had a wildly inconsistent season. 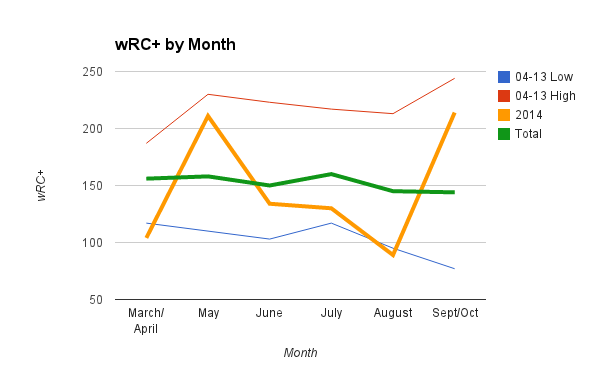 We know that there were underlying injuries driving this train, but I do have to say that the final month is pretty interesting. You can look at the rest of the season and say, Cabrera got hurt in June and it really affected him into August. You’re not shocked by a comeback, but such a massive one is pretty odd. Probably just a touch of sample size and regression to the mean, but the recovery itself was awful fast. There’s no perfect way to visually compare the way a player was swinging over long periods of time, but I think these two swings represent the issues well enough. Watch each GIF three times. Watch his arms. Watch the rotation of his upper body. Watch his legs. Also, for fun, watch how long it takes him to get down the line the first time. Cabrera is a gifted hitter, but he’s clearly vulnerable to injuries at this point in his career. You don’t have to worry much about him losing the gift next year, but you absolutely need to worry about his health. Today we’re kicking off a new series for the offseason that allows us to look back a player’s 2014 season and then ahead at their 2015. The series is called GIFGRAPH, as it will feature one GIF and one GRAPH that captures the player’s season and their value to the team. The series will feature all players who will figure prominently on the 2014 and 2015 clubs. It’s hard to say for sure whether the Prince Fielder or Doug Fister deal made bigger news last winter, but that’s a silly question to spend lots of time trying to answer. It’s clear that the Tigers came away massive winners in the first deal, at least as it pertains to 2014, and likely as it pertains to everything that will ever happen to the franchise forever and ever. “Won the trade,” is how the phrase goes. But what was it that made Kinsler so useful to the club? Obviously, Fielder’s injury made it a decisive win, but let’s assume we live in a world in which Fielder performed as advertised and gave the Rangers 3-4 wins of value thanks to a powerful left-handed bat. How did Kinsler make such an impact? Sure, he was a solid offensive performer (102 wRC+), but he’d been just about this good for the last couple of years and Prince would obviously have been better if healthy. Two things stand out about Kinsler’s 2014 season. The first was his terrific base running (9.1 BsR), but the second, and our focus here, was his superb defense at the keystone. Kinsler is an average hitter, but with some good base running chops and durability, you know you’re getting a solid major league player. What the Tigers didn’t count on, to this degree, was how his defense would vault him from good player that is cheaper than Fielder and allows Cabrera to play first to one of the most valuable players in the game. His defense was simply terrific. He’s had these seasons before, with 3-4 great years by DRS and 2 great years by UZR entering the season, but you don’t always expect it to continue into a player’s thirties, especially once you get him around the defense allergic Tigers. But he did. Kinsler posted a 13 UZR and 20 DRS at 2B, nearly winning the Fielding Bible award for the best glove at the position. He helped the Tigers pitchers worry less above ground balls, especially Porcello, and produced 1-2 wins of value for the Tigers above average at the position. He did so by offering range at the position and solid glovework, something Infante was okay at and they couldn’t find in a post-Polanco world, otherwise. 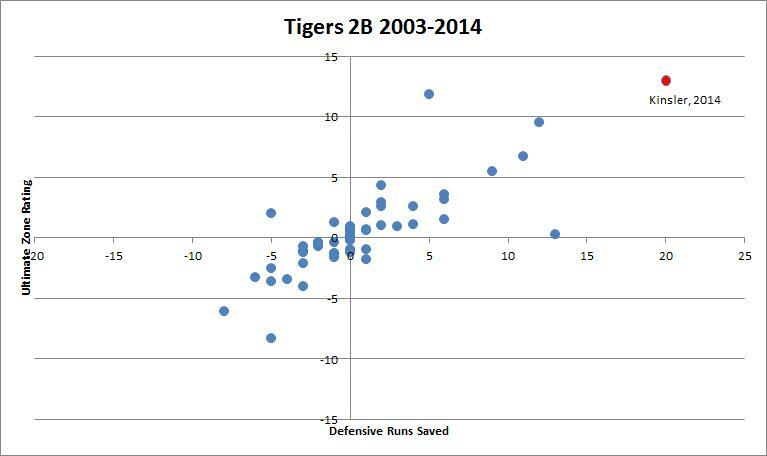 Most interestingly, one could argue that Kinsler had the best defensive season at the position for a Tiger in the modern statistical era (2003-present). There’s not a ton of great competition, but the Tigers brought in the best defender they’ve had at the position, potentially, since Dombrowski took over more than a decade ago. Kinsler’s 5.5 WAR season was a big reason the Tigers made it to the post-season and while the projections don’t expect another dazzling defensive year, they like his skill set enough to expect 3.8 WAR for 2015. 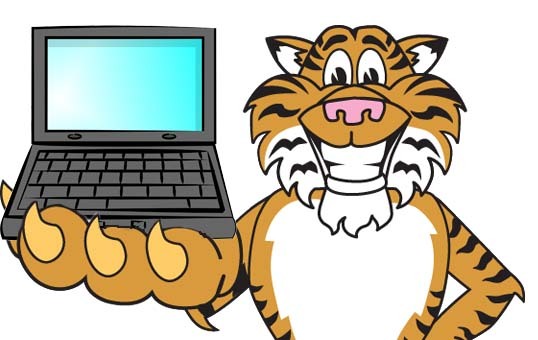 The Tigers won the trade.